We can provide a free, no-obligation quote for accredited registration today. Request a Quote. ISO 9001 is an international standard which outlines organizational requirements for adoption of a quality management system (QMS). ISO 9001:2015, published on September 15, 2015, is the current edition of the standard. The standard is designed for use by organizations of all sizes and in all industries, to exhibit their capacity to consistently perform their industry specific duties in such a way that meets or exceeds customer expectations and regulatory requirements. Through the use of the process approach, Plan-Do-Check-Act cycle and risk-based thinking, organizations are able to align their quality management system with the requirements of other management system standards, such as, ISO 14001. ISO 9001 is maintained by ISO (the International Organization for Standardization) and is administered by accredited management systems certification bodies like The Registrar Company. Our highly-skilled and accomplished auditors are at the top of their field with years of auditing experience and industry knowledge. TRC auditors aim to reduce disruptions while performing audits and strive to fully understand your business to reveal opportunities for reducing costs, decreasing time to market, and increasing overall efficiencies. Associating your company with an internationally recognized and trusted certification shows your customers that you hold their satisfaction and expectations above all. Your company knows that ISO 9001 certification and industry specific QMS registration adds real value to your bottom line through increased efficiency and reduced risk – and working with the best Certification Body for your unique needs should be top of mind. Certification can be a lengthy process, and you will be working closely with your Certification Body and Auditor for years to come, ensure you pick the best. TRC is internationally recognized and trusted. 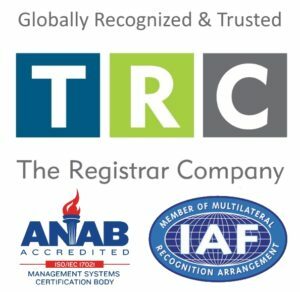 With a large network of auditors, TRC is an international certification body with local benefits. With dedicated Client Services Managers, and family-owned and entrepreneurial values, our clients are family. We take the time to understand your business and your unique needs. TRC audits are more than a checklist, we highlight your corporate strengths, and find opportunities for improved processes to ensure you stay competitive and thriving. TRC works with you to ensure minimal disruptions so you receive the highest benefits from the auditing process. A Client Services Manager is assigned to each client to provide a single point of contact. The professionals delivering audits are key to our success. Feedback is collected on each audit and we work hard to incorporate your improvement suggestions.